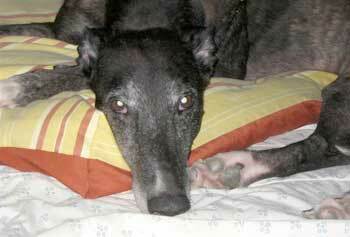 Lad, aka OL's Tender Lad, is a dark brindle 5-year-old male greyhound, born August 8, 1999. His sire is Molotov and his dam is Jr's Tender Beth. 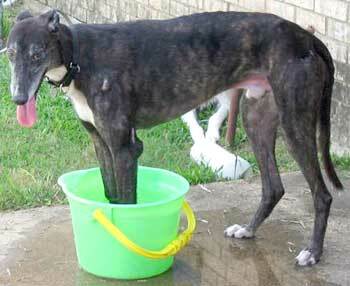 On July a call was made to the Ft. Worth Animal Care & Control Center about 4 greyhounds that had been dumped. The dispatcher radioed back to the shelter and said greyhound rescue should be contacted immediately as one of the greys was in horrible condition and needed immediate medical care. That was Lad - you can read his story from that day to now, and marvel at the care and love he has received from all who have touched his life. It is not known if Lad had a racing career or not, but one thing for SURE  he is so ready for his retirement and forever home. Lad is very loving and is a wonderful companion for humans and animals. Lad is small animal and cat tolerant. and he uses them to get extra treats. Lad would be happy in a home with or without other animals. While he loves other animals  he really would love having a mommy and/or daddy the most. Read about "Poor Ol' Lad" in his forever home.